Posted 8/5/2016 8:11pm by John Weygandt. Sometimes one just has to acknowledge great good luck. On July 27 a microburst of wind of tornado like strength passed down Youngs Road and created devastation so great that it prevented me from returning to my home that night. However Stargazers Vineyard was unscathed. The deadline for reserving your place at the Rendezvous with Mason & Dixon at Stargazers Vineyard August 13 is next Wednesday, August 10. We have something extra to celebrate! Posted 6/20/2016 1:33pm by John Weygandt. Posted 6/3/2016 5:45pm by John Weygandt. Posted 5/24/2016 7:48am by John Weygandt. Posted 5/6/2016 10:05am by John Weygandt. Posted 2/18/2016 3:58pm by John Weygandt. Periodically Jill Weber the Wining Archeologist offers to the public a "Wine and History" tasting at Jet Wine Bar in Philadelphia. The theme of the most recent tasting was Petit Verdot, which included our 2014 vintage. Here is what she wrote about Stargazers Vineyard. Chester County in Pennsylvania lies west of Philadelphia, and forms part of the border between Pennsylvania and Maryland. This border dates to ca 1780, as established by the surveyors Mason and Dixon. Their work was begun at an observatory from which they calculated latitude and longitude bearings from the stars. This observatory, now marked by the Star Gazers’ Stone, stands a few miles from Stargazer’s Vineyard, in Coatesville, PA.
in which she gives the "back story" on the other wines in the tasting as well as interesting historical and archeological facts including how the city of Chester England got its name and how Chester County was formed. Posted 11/28/2015 3:54pm by John Weygandt. It was good to see all those who came to celebrate the first wine of the vintage on November 21. The Dornfelder Nouveau 2015 sold out immediately. On this Thanksgiving weekend, we thank all of our customers for their support in 2015! Stargazers Winery Tasting Room will be open for tastings and sales Saturdays and Sundays noon to five through December 27. Take note of that date so you do not fail to buy our Sparkling Wine for toasting the arrival of 2016. In 2016 Stargazers Winery Tasting Room will be closed for the months of January and February. Posted 11/18/2015 12:05am by John Weygandt. Posted 11/17/2015 11:54pm by John Weygandt. The art theme for the Brandywine Artisan Wine Trail in November is "The Art of Ceramics." At Stargazers Vineyard artist Suzanne Kent, member of The Potters Guild, is exhibiting her latest creations. 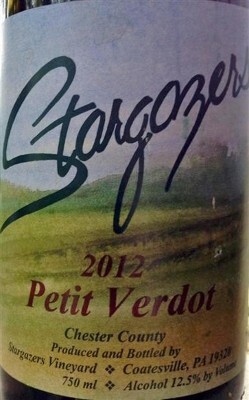 On this Saturday November 21st, Stargazers Vineyard will celebrate its annual "Dornfelder Day" which introduces the first wine of the vintage . Celebrations start at noon at Stargazers!